Why exactly does your evergreen tree turn brown in the winter time? So we’re more than a week into 2018. In January, the cold weather has lost its novelty and everyone just wants to be warm again. Well, so does your tree. 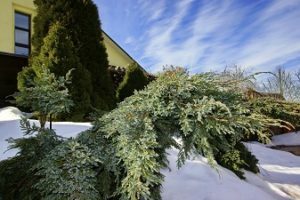 Why exactly does your evergreen tree turn brown in the winter time? Let’s take a closer look to find out. First of all, if you don’t like how cold it has been, then chances are, your evergreen tree doesn’t either. The roots of the tree need the water that is saved up in the needles once the ground has frozen over. The problem is, the remaining water will be consumed quickly enough that the needles themselves turn brown too. Is your tree dying from lack of water? All you have to do is give it a protective coating with what is called an anti-desiccant spray. Although the daytime is shorter during the winter, the sun still sticks around. Sometimes, there will be enough sunlight that your evergreen trees will dry out more quickly as well. If you’ve ever suffered a mild sunburn, then you know what it’ll feel like when your evergreen tree suffers from sunscald. The needles and bark are both drying out. In case you have any burlap laying around, you can use it to cover your trees and protect them from the nasty winter weather. This entry was posted on Friday, January 12th, 2018 at 11:27 am. Both comments and pings are currently closed.